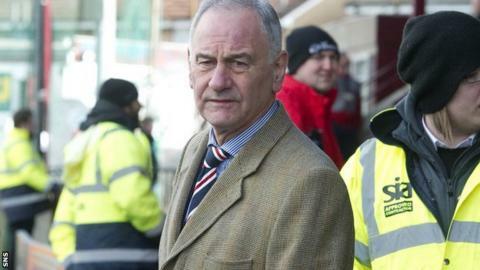 Rangers chief executive Charles Green believes a tax tribunal verdict "undermines" a Scottish Premier League investigation into alleged undisclosed payments to former Ibrox players. The tribunal ruled that the old Rangers company's use of Employee Benefit Trusts was not illegal. But the SPL's own commission could yet say it was against its own rules. "The judgment serves to further undermine the validity of the SPL commission," said Green. "As we have said all along, the SPL decision to press ahead with a commission was ill-timed and fundamentally misconceived." "Oldco" Rangers, which is now in liquidation, used its EBT scheme from 2001 to 2010 to make £47.65m in payments to players and staff in the form of tax-free loans. HM Revenue and Customs had challenged the payments, arguing that they were illegal, but two of the three judges on a First Tier Tax Tribunal largely accepted that the payments were loans rather than wages. The SPL's own three-man panel, chaired by Lord Nimmo Smith, was due to begin hearing evidence last week, but the case was postponed because of ill-health with no new date set. One of the possible sanctions of the SPL's investigation, should Rangers be found guilty, is the stripping of titles, but the "Big Tax Case" has no financial consequences for the club now playing in Division Three. Green, whose consortium purchased the business and assets of Rangers after they were consigned to liquidation in the summer, said: "I am sure that all Rangers fans will welcome that a judgment has been reached on this case at last. "That said, the judgment will not affect the operations of the club nor the proposed flotation of the business as a public company. "This case is historic and was a matter for The Rangers Football Club plc, which is in liquidation. "The Rangers Football Club Ltd is a corporate entity formed following the acquisition in June this year, by a consortium led by me, of the business and assets of Rangers, including the club and its honours. "As HMRC stated in June, when they decided to vote against the proposed oldco CVA, no tax liabilities relating to 'oldco' would transfer across to the new company. HMRC have recently reaffirmed this position to the club's tax advisers, Deloitte. "The Rangers Football Club Ltd is a company free of external debt." Former chairman Alastair Johnston agreed with Green's assertion that Rangers should have no case to answer in relation to the SPL probe in light of the tribunal's verdict. "The whole concept of Rangers being stripped of titles should go away - and go away quickly." Johnston also believes the painful process of administration and liquidation could have been avoided had the tax case verdict been known before Sir David Murray sold his majority shareholding to Craig Whyte for £1 in May 2011. "We would not have gone through the administration and liquidation process, for sure," he said. "If you will actually wind the clock back to the alternatives that the bank and Murray Holdings had with respect to alternatives, the big hang-up was the contingent liability with this massive tax liability hanging over our heads."